We went to visit our squirrel friends Sunday. When we entered the park in front of the white house, we heard several squirrels up in the trees (in opposite sides of the park) vocallizing their warning/distress call. There were no squirrels on the ground, and no pigeons around. We went over to our favorite squirrel tree, and started to feed a couple (they didn't want to leave the tree). Then we saw why. There was a hawk flying through the park. It landed on a tree limb right next to John! The hawk paid no attention to us at all- even though we were very close to it. 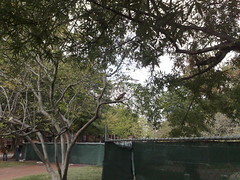 It was watching a squirrel that had hidden under a pice of mechanical equipment. It then flew off after a squirrel at the other side of the park. That squirrel got away, and the hawk flew off.